As one of the most celebrated spiritual teacher alive today, the great Advaita master Mooji has helped thousands of seekers progress on the path towards enlightenment. With his trademark warm-heartedness and intoxicating presence, he’s expounded a boundless amount of wisdom on the practice of self-inquiry and the ultimate truth of non-duality. Incomparable to any of the world’s other great theologies, a mesmerizing spiritual mysticism permeates throughout the religion of Hinduism. In addition to being illuminated in ancient scriptures such as the Upanishads and Bhagavad Gita, this auspicious distinction can also be found in the life stories of iconic gurus and seers such as Swami Vivekananda, Paramahansa Yogananda and Anandamayi Ma. While most of the faith’s immortalized figures, whose tales naturally give rise to a sense of divine wonderment, hail from India, it’s another individual, coming from lands far from the Subcontinent, who might have the most perplexing story of all. It was on January 29th, 1954, when Euphemia Bartlett and Enos Moo-Young welcomed their son Anthony Moo-Young into the world, some 9,000 miles away from India in the Jamaican coastal city of Port Antonio, and it wouldn’t take long for his extraordinary story to begin unfolding. The first events which lead the young boy, who’s now simply known as Mooji, to where he is today unfortunately included a number of disheartening occurrences that took place during his childhood. Not only did his mother Euphemia move to England when he was just one-years-old, but he’d also unexpectedly lose his father, to a bout of pneumonia, when he was eight. Even though his natural parents weren’t there to raise him during some of his most important developmental years, Tony was lucky to have an extended family that offered him unconditional love and support throughout his youth. So much so, in fact, that his relationship with his aunt Eunice, who took over his care-taking responsibilities when Euphemia left for England, most closely resembled one of a mother and child. Moreover, although he initially disliked the structured parenting approach of his Uncle George, who became a father figure after Enos passed away, he’d later come to appreciate his guidance and role awakening within him a deep love for biblical stories and the teachings of Jesus Christ. From the time of his father’s death until he was a teenager, Tony remained under the guidance of his aunt and uncle. Things, however, started to change in 1967, when he was 13-years-old, as his Uncle George moved to America and he began corresponding with his birth mother the following year. From this communication, a shared yearning to be together was rekindled and Tony ultimately started a new chapter of his life in 1970 by moving to join his mom in the United Kingdom. Throughout the first 15 years he spent in England, Tony adjusted to a new way of life while following a path conventional for someone his age. After graduating from secondary school, he earned an art degree from a local university and made some money at a number of dead-end jobs. Then, the socially enthusiastic youngster started working as a street artist in London, creating portraits of tourists outside the National Portrait Gallery and on the famous Shaftesbury Avenue at Piccadilly Circus. Although he greatly enjoyed this work, and the opportunity to meet people from all over the world, things for Tony were about to drastically change once again. The year was 1985, and racially charged tension in England had reached dangerous levels, when Tony’s eldest sister Cherry was accidentally shot by policed and paralyzed for life. Not long after the infamous incident, which grabbed nationwide headlines, riots sparked throughout Brixton and Tony was inescapably pushed into the role as family spokesperson. Although the impact of the experience, and an increased public profile, effectively put an end to Tony’s career as a street artist, he soon found work designing stained glass windows at a church in the centre of Brixton and it was around this time when his spiritual journey truly commenced. Upon finding the guidance of Ramakrishna, Tony became increasingly interested in Hinduism and he’d soon have the fortuitous spiritual opportunity to take in India’s intoxicating devotional ambience firsthand. Without maintaining a full-time professional career, a choice that was driven by his thirst for truth, the enthusiastic seeker undertook a project painting a mural for his sister and was gifted with a nice sum of cash for his efforts. With this unexpected money, he then made the decision to travel to the Subcontinent with the sole intention of visiting Ramakrishna’s home and Calcutta’s Dakineshwar Kali temple. In the months that followed, Tony continued to study under Papaji while finding some time to visit a number of India’s holiest pilgrimage sites. Unfortunately, his enchanting trip was cut short by the devastating news that his eldest son had died of viral pneumonia back home. Upon returning to England, Tony faced the unimaginable reality of burying his own child. In the two years following Papaji’s death, Tony’s work selling incense gradually morphed into a small street side chai tea shop and the number of seekers who gravitated to him continued to multiply. Although he preferred to remain in silence at this point in his life, his followers’ questions, and his own prayers to God, eventually drew out the charismatic guru who’s beloved around the world today. It was from holding regular spiritual meetups, in his apartment, with his most determined devotees that both the name Mooji and his now iconic Satsang gatherings came into existence. Since formally becoming a guru in 1999, the legend of Mooji has continued to expand and his following has grown to include tens of thousands from all parts of the world. Today, he live and teaches at his Monte Sahaja home and ashram located in southern Portugal. 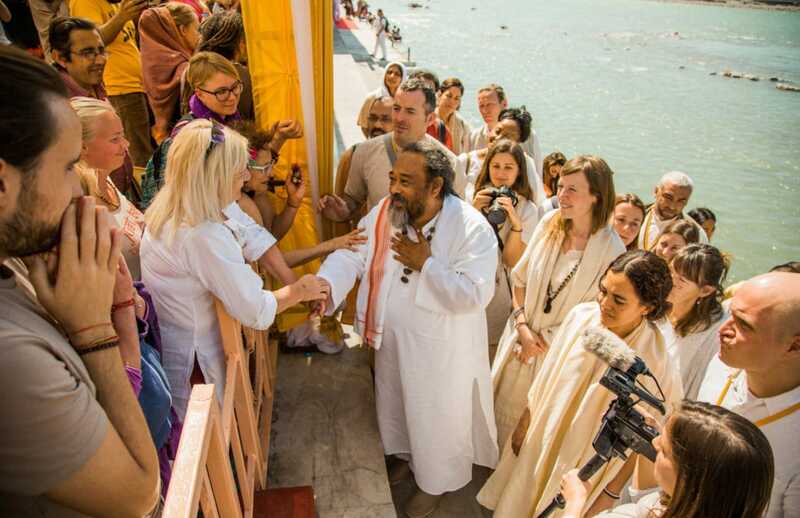 Each year, he travels to India to offer Satsang for two weeks in Rishikesh, one of India’s most sacred spiritual cities, and he regularly holds events in the United Kingdom. Because his guidance is not easily accessible to all of his followers, Mooji’s organization offers them the ability to live stream Satsang, participate in retreats, and explore a vast collection of spiritual videos at Mooji.org. Additionally, Mooji has written 8 books, including Before I Am, White Fire: Spiritual Insights and Teachings of Advaita Zen Master Mooji, and Vaster Than Sky, Greater Than Space: What You Are Before You Became, over the past decade.